I offer workshops on many topics in music and sound. Workshop length is often an hour or 2 or 3, but has ranged from 20 minutes to semester-long courses. Some schools/venues opt for week-long residencies. The sessions can be tailored to any age from 8 years up and any level of musical ability from absolute beginner to virtuoso. Topics include listening skills, electro-acoustic instrument building, collective improvisation, and many other topics that involve/connect music, sound and the perception of sound. I have taught collective improvised music at venues including Oberlin Conservatory, Harvard University (culminating in a performance at Paine Hall), The Rivers Music School (I presented at their annual Seminar on Contemporary Music for the Young in 2007) and many high schools, elementary schools, community centers and improvised music festivals throughout North America. Please see my CV for a select list of artist residencies and workshop presentations. 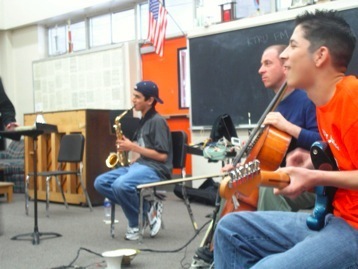 That’s me there with my cello teaching a workshop on free improvisation in a public school in Houston, Texas. Nameless Sound is the excellent organization that sponsored this event and many others like it. Shown here is the aftermath of a week spent working with high school students (I’m the bald guy in the very back). I developed a music composition curriculum that features expanded monochords with movable/removable frets. The instrument’s built-in limitations bring focus to the elements of melody and form. I designed the instrument to be extremely approachable by music beginners and yet capable of posing challenges to experienced musicians. For this class the students built their own instruments with tools and materials I provided. This video clip is from a workshop I gave at the Megapolis Audio Festival in Boston. It begins with a 20 seconds on my electronic instrument. The rest of the video features the Speaker/Battery instrument. I have presented workshops on the Speaker/Battery instrument many times and at many venues ranging from grade schools and high schools to college classrooms and juvenile detention centers. It is a wonderful introduction to electronic music and brings awareness of the physical aspect of sound. The idea came from the Nic Collins book: Handmade Electronic Music , which I highly recommend. 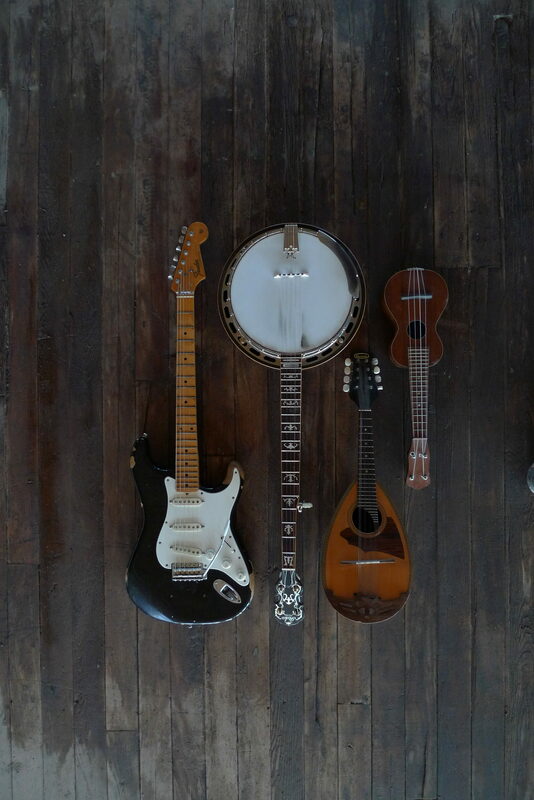 Find out more about Instrument Building & Improvisation.